Thanks to +Russ for the image. Goose Island Brewing makes some pretty fantastic beer that doesn’t get a whole lot of focus in this competitive Seattle market. 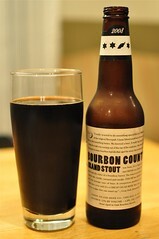 They offer some great specialty releases, though, with the highlight of their lineup being the Bourbon County Stout. Beer geeks (myself included) go crazy for this bourbon barrel-aged imperial stout. 2013 was the first year since about 2010 that Seattle received any allocation of that great beer, and it was very limited. There are also multiple variants of Bourbon County that I’m not sure we’ve ever seen in Seattle. This year, Goose Island has embarked on a migration across the country to visit many of the markets where their beer is available. They are spending a week camped out in one city at a time, and they are bringing a whole bunch of great beer with them. According to a quick press release, they will be in Seattle the week of September 2nd. They’ll be “hosting several events all week long – including tap takeovers, beer tastings and more.” You can expect the events to be hosted at several beer bars across the city. Goose Island has not communicated any specifics, yet, but Brouwer’s Cafe has posted that they will be one of the event sites. They’ll be pouring some pretty awesome beers on September 3. I’ll post more info on other events as it becomes available. Keep your Chicago Budweiser in the Midwest. They practically give it away just to get bars to take it. They give away the ales, not the the craft which is still brewed exclusively in Chicago. They were at Chuck’s tonight with a few bottles of BCBS for sale, BCBS on tap, and bottle pours of something else aged on cherries. There was also Honkers, 312 Wheat, two IPA’s, and Pepe Nero sasion on tap. The BA beers were great, the other stuff wasn’t anything special. They were’t shy with the schwag, I came home with a free shirt and pint glass. Just looked more carefully at my bottle, it is BC Coffee Stout, lucky me. Now I need to find a good bottle share to take it to. Any word on other events in the Seattle area?